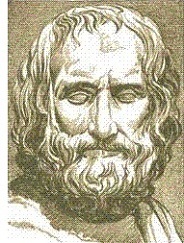 Euripides (ca. 485-406 B.C.) - Third and youngest of Athens' three great tragedians, the year of Euripides' birth is a bit more uncertain than the other two. It was as early as 485 and as late as 480 B.C.. We know he was born on the island of Salamis, which have lead many to speculate that he was born in 480, on the day of the famous Battle of Salamis itself. Sparsely populated in ancient times, it would have been heavily populated by Athenians while they took refuge there during the Persian invasion. Popular myth has him being born during the battle, intricately tying the three famous playwrights together. Aeschylus fought there, Sophocles celebrated the victory by leading the paean and Euripides was born while the conflict was playing out. He won the Dionysia only five times, fewer than his other two (Aeschylus won it 13 times and Sophocles a whopping 18). Euripides entered his first Dionysia in 455 B.C., but it would be 13 years before he would win his first. However, just as Sophocles beat Aeschylus in 468, Euripides beat Sophocles in 442, for his first victory. And we have more of his plays today than the other two combined. Of the 80 to 90 that he wrote, 18 of them survive (19 if you count Rhesus, which many scholars do not). Euripides distinguished himself from Aeschylus and Sophocles with his propensity to to mix humor into his works, a genre termed as "Satyr plays". He was also multi-talented, dabbling in several professions before settling on writing tragedies. For a while he was a boxer, and then a painter, finally becoming a playwright in his mid to late twenties. A notorious recluse, he shunned society and lived most of his life on the island of Salamis in a cave.